I am writing about the “public consultation document “ on the proposed fluoridation of the Southampton water supplies. I am very concerned about the way the campaign is being presented. 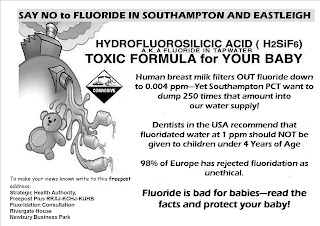 1) I notice that the Southampton City PCT has put a full page advertisement in the Southampton Echo in favour of fluoridating the water supply to 1ppm. 2) I also notice that at the beginning of your public consultation document you state “In 2009 the South Central SHA will decide whether or not it is a good idea to put fluoride in the water supply. They will base their decisions on research evidence, surveys, expert guidance and feedback from local people. The consultation is not a “vote” so the option with the most support will not necessarily be chosen”. I understand that a SHA has to be instructed by a PCT to consider and implement a new measure? It would thus seem from 1) and 2) above that the PCT has already decided in favour of fluoridating the water supply and would therefore override a public vote against fluoridation. Is this the case? The public consultation document is also very much biased towards fluoridation in the way it uses language and statistics, even though it gives some of the arguments against and therefore gives a very unbalanced picture. This is a dangerous precedent for public consultations. The headline “Topping up the natural fluoride levels in our water will reduce tooth decay” in the Southampton Echo half suggests that the naturally occurring fluoride in the water would be “topped up” with natural fluoride. In fact it will probably be topped up with hexafluorosilisic acid, one of the most corrosive acids in existence, which in the form in which it would be transported to the water works, is strong enough to dissolve the tarmac on the roads, if spilled! Decisions around the fluoridating of our water supplies have mostly been based on the “York Review” of 2000, which suggested an improvement to children’s teeth of 15%.It also noted a 48% incidence of dental fluorosis : 12.5% of cosmetic concern. Your consultation document doesn’t mention these figures and only shows pictures of mild and very mild cases of fluorosis. Psychologically this condition causes as much distress as does missing or bad teeth. The advertisement in the Southampton Echo also quotes Dr. Jacky Chambers, Director of Public Health, Heart of Birmingham teaching PCT as saying “Our own monitoring of local health trends confirms the best available evidence that 1ppm of fluoride………does not cause health problems”. The York Review was based on the ”best available evidence”. This evidence as regards the “effectiveness of fluoridation in reducing caries”, in a letter by leading members of the review panel to Hazel Blears the then minister, said “ we could discover no reliable good quality evidence in the fluoridation literature worldwide” and regarding “Effectiveness of fluoridation in reducing inequalities in dental health across social groups”, they said “This evidence is weak, contradictory and unreliable”. The consultation document suggests that you have already spent considerable sums of money on educational programmes to try and help people in some of the poorer areas of Southampton with little success. The York Review suggests that these “inequalities” are not often solved by mass medicating whole areas. In paragraph 1.7 of the consultation document you say “This document provides information about the proposal and sets out all the facts about fluoridation.” This statement is blatantly untrue as I could send you tens if not hundreds of references to harmful effects of fluoridation, none of which are mentioned in your consultation document. The statements by the Southampton City PCT would therefore not only seem to be misleading but also partially untrue. Please would you let me know if you have studied the evidence of the York Review and on what other more recent scientific and “peer reviewed” evidence you may otherwise have based your judgements? I eagerly await your personal response to my questions and will make the appropriate conclusions if I don’t receive a rapid response. 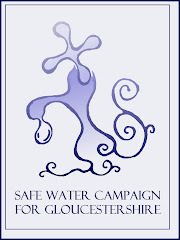 Chairman of the “Safe Water Campaign for Avon, Gloucestershire and Wiltshire”.